This was my first cycling holiday. There were parts that were harder than I had anticipated. However I made it and thoroughly enjoyed the experience and would do it again. It was a great way to see the country and the way of life and interact with the locals. The organisation, accommodation, food, guides and bikes were of a high standard. I am glad to have done the trip with the beach extension as this gave another insight into life in the country and the ability to keep cycling or not. I would recommend it to anyone. Deborah Hammond, Washington, United States. This trip had absolutely no glitches, amazing for two weeks in a poor country, I am incredibly impressed by your logistical genius. Excellent local guides especially in Bagan. A lovely country with very friendly people. A good cycle route with varied countryside. Everything very well organised. Ngapali beach was super. Nice quiet beach and lots to do. Full day jungle trek we did was excellent. Myanmar is certainly worth a visit before it gets too touristy. I thoroughly enjoyed another wonderful Redspokes adventure. Burma is a great country, the people were so welcoming & friendly accompanied by great scenery. We had a great team looking after us who shared their knowledge. As always it was enjoyable to experience some of places that are not visited by many tourists. 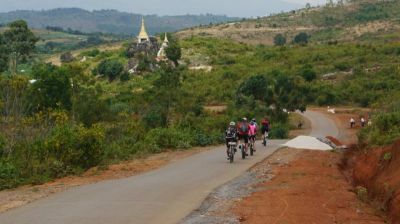 I really enjoyed the experience of Bike riding in Myanmar. Countryside was beautiful and locals very welcoming. Very impressed by Chan’s organisation of the trip including the food. I had forgotten to notify I was vegetarian, but he organised vegetarian meals for me at short notice. Very nice being able to hop in the bus when it was becoming too hard to continue pedalling in the heat. Chan would always make sure everyone was ok and enjoyed the trip. Absolutely superb trip, exceeded all my expectations. The crew looked after us fantastically well - nothing was too much trouble. Overall an excellent trip to a fascinating country. A fabulous tour in a fascinating country full of wonderfully welcoming people, amazing sights and challenging cycling. Kalayar and her team couldn't be more helpful, the accommodation was uniformly excellent even in the less traditionally tourist locations and the attractions of Myanmar combine to make this a great 2 weeks. As usual, redspokes gets you to places that other tourists generally don't see, and that comes with its own challenges - the accommodation can be "rustic" at times! For me that just adds to the appeal... you can't beat a bit of reality once in a while. I can't praise the staff enough - I can honestly say I've never been so well looked after on a cycling trip! Kalayar is an angel and nothing is too much trouble for her and her team. The scenery on this trip is fantastic but what made it for me are the Burmese people - they're the most amazing smiley, friendly, gentle people I've ever encountered and cycling in their country was an absolute joy. "This was my third redspokes tour and it won't be my last! Everybody should run to see Burma now before it changes forever. As always redspokes got me to places away from the main tourist draws, off the beaten path, which made me feel like I was the only foreigner for hundreds of miles. And with the wonderful local guides I was always made to feel at home even though I was only a visitor." What absolutely delightful, charming, friendly, and most helpful staff we had to look after us: to make sure we remained safe while on our bikes, to make sure we were well hydrated and fed along the routes, to tend to our luggage before we knew it needed tending, to kept us informed and to educate us, to take care of the nearly endless little details and behind the scenes scrambling and work, and to make sure we enjoyed our Myanmar journey every step and pedal of the way! "You want ice cream? We will get that across the street for you!" "How big is the pool? We will measure it for you (22 x 34')!" "You are not feeling up for dinner? We will give you Choco-Pie snacks now for when you wake up hungry at midnight!" Kalayar was absolutely the sweetest and most genuinely caring woman I've ever encountered on a tour; she considered the six of us bikers her "children" in looking after our well-being, health, safety, and happiness for the entire two weeks. She also looks after her crew and fellow country men and women with the same concern, donating food or money to road crews as we biked throughout the country, supporting education with school supplies and books, and so many more things that we are certainly unaware. The landscapes were varied and beautiful, the routes and roads challenging but not an issue with the excellent front suspension Trek 4300s, the weather nearly ideal (save for a few days with rain showers and occasional downpours), and the locals we encountered through every village simply the most sweet, friendly, curious, and happily smiling people in the world! Myanmar is relatively still a land and people beautifully untouched by outsiders, especially when compared to the many neighboring countries in SE Asia that have been increasingly influenced for decades. This precious gift won't last forever. Please start training now and give beautiful Kalayar a loving hug from Lu Kong Gee Koko and Ah Shay Gee Nyi from California!